Washington: Dr. Denton Cooley, who sparked controversy and a feud with another pioneering heart surgeon when he performed the world’s first artificial heart implant in 1969, died on Friday at the age of 96, the Texas Heart Institute said. Cooley, who also performed the first successful human heart transplant in the United States, founded the Texas Heart Institute and was one of the most celebrated heart surgeons in the world. The Texas native was also known however for a long-running dispute with another world-renowned innovative surgeon in Houston, Dr. Michael DeBakey, over the implant operation. A spokeswoman for Texas Children’s Hospital, where Cooley’s son-in-law acts as surgeon in chief, said Cooley died in his Houston home on Friday morning, surrounded by his four daughters. 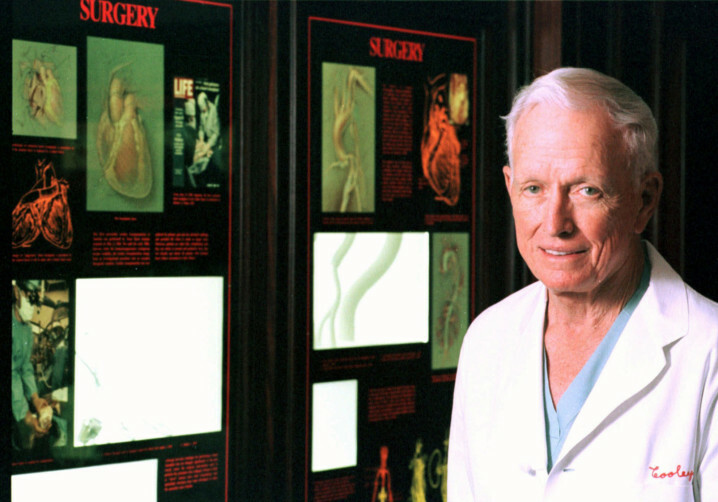 Cooley, who estimated he operated on about 100,000 people, developed many techniques used in cardiovascular surgery and received honors including the Presidential Medal of Freedom, the highest U.S. civilian award. “Nothing can compare with the activity of the human heart,” Cooley, who grew up wanting to be a dentist like his father, once told an interviewer. “And besides that, it’s always had a special connotation in our society, or in our life. It’s been the seat of the soul and the seat of emotions. “But now we find that it really is a tough little organ. It can tolerate a great deal and it certainly has been revealed that it can be corrected in many ways and even replaced by organ transplantation.” Cooley performed the first successful heart transplant in the United States in 1968, a year after South African Dr.
Christiaan Barnard had done the first one in the world. Cooley also broke ground with surgical methods to fix congenital heart anomalies in infants and children and methods for repairing and replacing diseased heart valves and went on to found the Texas Heart Institute. On April 4, 1969, with no donor heart available for a dying patient, Cooley implanted an artificial heart in Haskell Karp, a 47-year-old man from Illinois. The device kept Karp alive for 65 hours until a human heart became available. Cooley transplanted the human heart to Karp but the patient died a day later. The procedure led to trouble because Cooley had used an artificial heart developed in the laboratory of his former partner DeBakey without his approval. Cooley, who had worked with DeBakey at Baylor College of Medicine in Houston, argued that he implanted the heart device in an urgent bid to keep his patient alive until a human heart was available for transplant. DeBakey called what Cooley did an unethical “childish act” in order to claim a medical landmark, as well as a theft and a betrayal. The device had been tested in animals but had not been approved for use in people. The US government ordered an investigation and the American College of Surgeons censured Cooley. The controversy prompted Cooley to leave Baylor. In 2007 Cooley and DeBakey ended their feud and DeBakey died the next year at age 99. “He wanted to be able to say he was the first one to use an artificial heart in a patient,” DeBakey told the New York Times in 2007. “I never quite understood it other than his ambition was almost uncontrolled. I mean, you don’t let your ambition get you in trouble.” Cooley told the Times he was justified in doing the implant. He said that at the time he was performing more heart operations than DeBakey or anyone else and viewed himself as “the appropriate person to do the first implantation of an artificial heart.” It was not until 1982 that the first artificial heart intended for permanent use was implanted in a person, at the University of Utah. In his interview with the Times, Cooley said a lawyer once asked him during a trial if he thought of himself as the world’s best heart surgeon.